No Fenders -Formula 1, IndyCar and A Whole lot more..: F1: One Streak is Over, One Continues and one has just Begun? 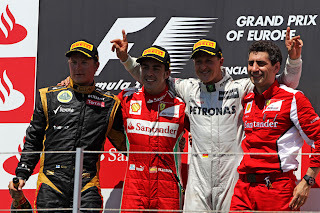 F1: One Streak is Over, One Continues and one has just Begun? What an absolutely BONKERS European Grand Prix nearly a Fortnight ago that was, as I was somewhat mystified over what happened to Master ‘Zebb’s utterly dominant RB8 chassis... As Vettel simply streaked away from everybody en route to building up a 19-second lead before the safety car quashed that. Then the car simply switched off; CRIKEYS! And I haveda say I was rootin’ the remainder of the race against “Fredrico Suave,” after Fernando Alonso had passed Grosjean... As Alonso will forever be firmly remembered as “Ferdi-duh-Putz” which Blogmeister Miguel christened him several years ago - during the McLaren dazes I believe, as Alonso’s just a wee bit too SMARMY to Mwah! But you cannot deny he’s a great driver - having come from a lowly 11th place to not be denied a magnificent victory on home soil in front of 90,000 adoring fans, as Spain defeated France twice in 24-hours; not to mention some sorta redemption over its German Eurozone lords, eh? Yet I was actually hoping Grosjean would make it eight-for-eight in this season’s string of different winners, but alas the record for most consecutive different winners at the beginning of a season is over. With reportedly the all time tally for different consecutive winners being nine in 1982. Meanwhile Grosjean’s teammate thee Iceman, nee Kimi Räikkönen and his Oomphlats; Hya! Who’d been lurking in the background and applying massive pressure towards Louise ‘JAGUAR Hamilton finally passed the Brit for second place in the closing laps before Hamilton whose rear tyres were shot basically tried closing the door upon the hard charging Pastor Maldonado, who’d surely claim the podium’s final step before ‘JAGUAR made a mess of I-T! With the two drivers colliding which unexpectedly opened the door for ‘DER TERMINATOR, nee Michael Schumacher to grab an unexpected third place finish... 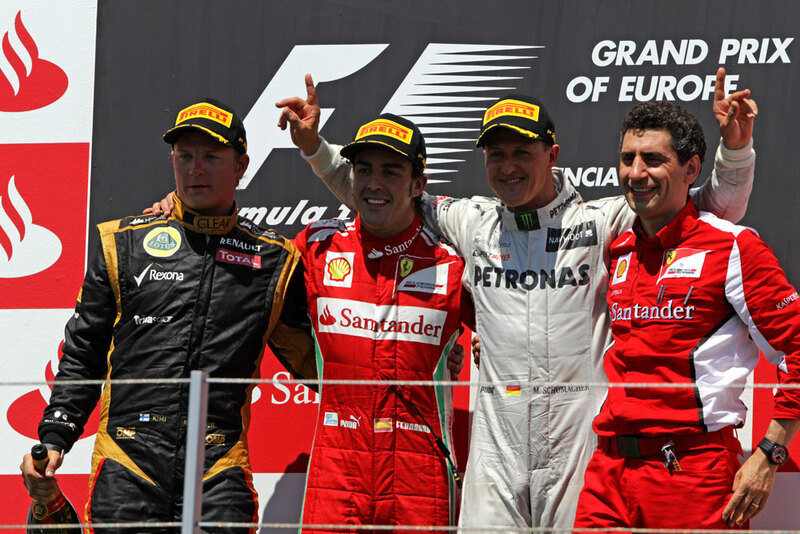 The German’s first podium in six years, since China of 2006; Aye Karumba! And then there’s the delayed irony of next going to ‘BLOODY Silverstone - which was the sight of Constructor-roe, where the F1 Teams told sir maXXum, a.k.a. MAD Max Mosley to go pound sand over his showdown regarding his proposed Budget Cap formulae which the teams completely refused - which ultimately led to Mosley’s ouster as FIA president, not to mention his Fraulein spanking antics, Ja Volt! Thus the irony? ‘Whale perhaps you’ve seen the headline of la Scuderia major domo Luca di Montezemolo pleading for immediate budget reforms to the sport of Formula 1 which ex-Ferrari boss Jean Todt, Mosley’s successor as head of the FIA has pledged to look into pronto... While Caterham’s chief technology officer Mike Gascoyne has also made the case for the FIA to introduce a budget cap - which wasn’t en vogue just some three summers ago. Then again is this just a shrewd way of trying to level the proverbial playing field?